My humanz knows I like to sleep on towels. That is why there are so many towels all around the house. 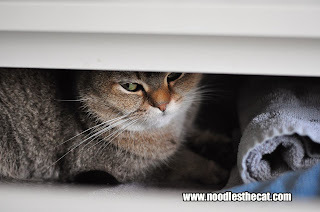 But did you know that you can find the best towels in a drawer? So when my humanz forgot to close the drawer, I jumped right in and used all the towels as my bed. It was the greatest nap ever!! !